We recently purchased a 65 acre parcel in Western New York and plant to build a cabin or two. We would like to build a small cabin 200-300 square feet which will later become a guest cabin or bunkie for the young ones. We plan to use the space mostly in the summer months but there are ski hill nearby and we might occasionally us it in the winter. We are wondering if we need to insulate at all seeing we will seldom use it in the winter. Would condensation be a big issue? We will heat with a wood stove. Lots of dead wood in the 20 acres of forest. For the small amount of time and money to insulate, you would be advised to do so. If you install a woodstove, you might otherwise be having to get up in the middle of the night to a freezing cabin to re-light or stoke the fire. The old "airtight" stoves that would smoulder all night are considered unsafe today, due to the amount of creosote buildup produced by a smouldering fire. You might also find the cabin would take a much longer time to warm up after the stove was lit, and returning from skiing to a cabin that stays cold for hours after the stove is lit isn't much fun either. insulate. I did not insulate - our cabin is small (100 sq.ft) and even a small wood stove heats it up very quickly. We have to keep the window open because it gets too hot inside even during very cold winder night. For a larger cabin, however, I would definitely insulate. 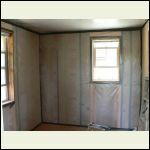 Your size (200-300 sq.ft) seems to be in the middle, however because the it is difficult to install insulation once walls are finished, I'd say insulate. Woodstove size and price of the insulation may play role in your decision as well. Regarding re-lighting/stoking of the fire during the night - I put one of those 4-hour-burning artificial/petro logs before going to bed. They also light up quickly if another one needs to be put in during the night. the insulation may help you in the summer as well . on the hot summer days our cabin stayed cool for quite a while if we kept it closed up . A 16x16 cabin has 1024sf of wall, ceiling and floor surface. I can always find R13 insulation for no more than $0.25 sf. That means you can insulate the entire cabin for no more than about $250 or $300 if you beef up the ceiling insulation. Very little cost really to help stabilize the temperature of your cabin. It will be money well spent. Insulate - for all the reasons stated above. It will probably be one of the best returns for the $ that you can do. More even temperature in all weather, and quieter. Condensation shouldn't be a problem if you follow conventional installation methods and allow for proper vapor barriers along with roof ventilation. Good luck. I have a little cabin I just bought...25X25 with 6 acres of land. I have to gut the cabin as it has sat unused for nearly 5yrs. Questions in, in order to protect the things in the cabin, do I insulate and/or install a vapor barrier? I have a lot or wood furniture and want to protect it while cabin is not is use. I'm basically starting from stratch....any ideas would be great. THANKS! in order to protect the things in the cabin, do I insulate and/or install a vapor barrier? 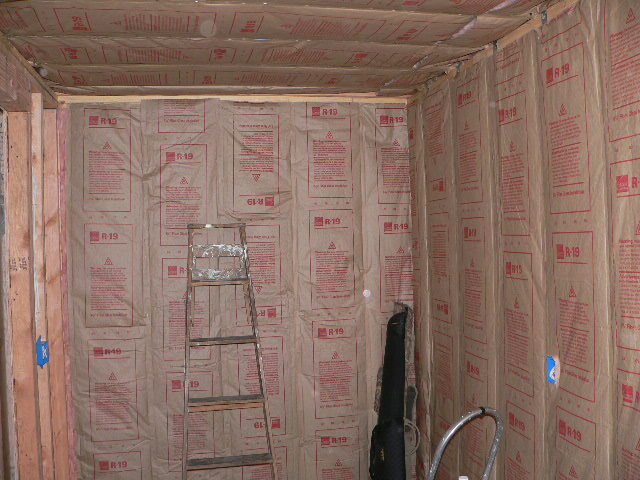 I don't know where you are, but regardless, wrap the outside with Tyvek and insulate the walls and ceilings at least.... You can also add an interior vapor barrier, but it's usually not necessary. I am in Western New York....cabin is finished on the outside with cedar shake shingles. That being said... I would have Tyvek'd the outside, but it's finished. So Inside... insulate and vapor over the insullation or is that not needed. Thanks for the help... really appreciated! So Inside... insulate and vapor over the insullation or is that not needed. We have built my son a small 300 sq ft cabin. And are almost to the insulation. Is the poly on the inside still used in the south? , unfaced isulation and poly inside..
the cabin we are building has a sheet metal outside rear wall..
rest of the outside will be rough sawn red cedar ,, i woundered what ould be the best thing to place on the wall behind the cedar? poly? tar paper? or should i buy some ty-vek? Looks like he good old felt paper performed well in most test . ! My prefab cabin came with no tyvek wrap... My solution? 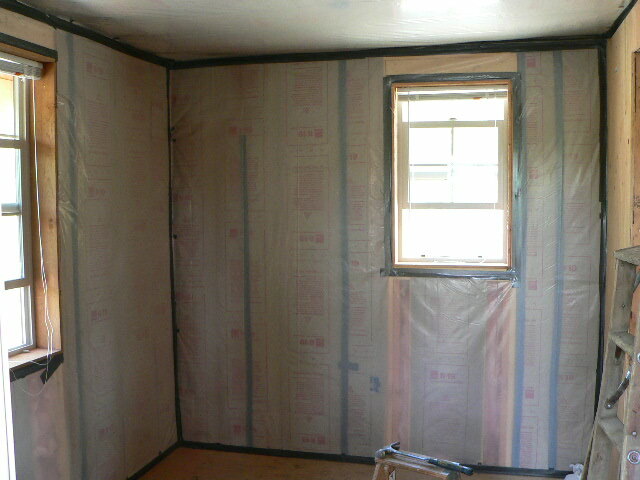 I plan to paint the interior walls and ceiling with Kilz primer, PRIOR to adding insulation. Might be over kill, but I dont think so. Insulation is a must! I would rather spend the winter looking at the paper wrap on the back of the insulation, and wait on covering it, rather than think I saved any money. I am planning to use pole construction for my 12x24 cabin due to a bit of a grade. That being said the underside will be mostly open. I am looking for suggestions regarding insulation/vapor barrier and rodent proofing. Should I simply use fiberglass batts between and 6 mil over the joists? Panels would be costly but would that help with the rodents? I just got back from insulating mine. I used R19 and already had a vapor barrier under the siding, I also added another vapor barrier, sealed the interior one air tight. I can heat it with a match now. If you dont use it in the winter, still insulate, keep it cool in the summer. Plastic wrapped and air tight. Curious - has anyone tried using foam insulation for the walls/ceiling? I was reading about the Tumbleweed tiny houses and it seems that is what is used in them. I've seen the damage of plastic sheeting used on the interior of the house behind drywall or paneling. I suggest doing a bit more research before going this way. My recollection is that this methoid started in late 70's and by the late 80's certain people were seeing thousands of $'s in damage inside their wall cavities. The water vapor rots the framing and outbreaks of mold start appearing all over the place. Just did a repair last month. It's climate dependent; hot 'n' humid climate should never have the plastic warm side vapor barrier. On the other hand those in the frozen north are generally advised to have it. Big potential problem in the US South. I built a 10 x 20 cabin, using rough sawed 2 x 4 studs and board and batten on the side. I put a steel roof on it. l have a wood stove for heat. When the temp. is cold and it is windy I lose heat fast. Should I insulate between studs on sides and rafters with faced insulation or is there drawbacks to this. Please advise before I do this. The greatest heat loss is through the roof, then the walls, then the floor. Insulation in the walls and/or roof would definitely help make it warmer and easier to heat. 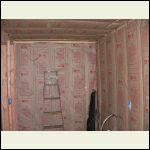 Most places should have the kraft paper or polyethylene sheeting on the inside, warm side of the insulation. There are southern areas where that is not recommended IF the interior is cooled with A/C in hot-humid weather. Roofs have ventilation requirements as a rule. Ah - seems like a no braining to insulate a small cabin. Insulation is not expensive and can save on heating of the cabin in terms of wood or other. But, how does one insulate the floor of a small cabin? Rodent proof? To me, insulating the floor would be paramount considering if your contact to the cabin is walking/standing in it. And it would be cool underneath the cabin with draft too. We have a 16x40 and of course insulated(we are in Canada) but you should at any size. But what do we use to finish the walls as we were told some things would not stand up well if you occasionally heat in the winter. Also our cabin is built on posts. How to insulate the floor? How to insulate the floor? Use joists that are deep enough to permit the amount of insulation desired, even if that means using joists that are over sized for the span and loads. The insulation should be up against the sub floor. There are spring steel wires that can be used for that. Then close the bottom side of the joists with 3/8 plywood. I have purchased a cabin that is older and in need of renovation. When it comes to deciding on insulation material, I've heard that fiberglass pink is like catnip for rodents. The love to nest in it. Has anyone found this to be true? what are the alternatives? We have a 200 square ft. cottage that is not insulated and gets very hot in the summer. Will insulating help? Would just getting the roof insulated help? My husband is worried about cost and says a new window is more important. I think we can do both. Insulate... never wrong. And rigid foam is so much better than fibreglas or Roxul.